I say nothing about Ledaig, because last time I did, I caught a shovelful for that. So, yeah, we’re trying some Ledaig again… Or perhaps this, Ledaig’s a peated version of Tobermony (not kidding). Ledaig 2005/2017 (45%, Gordon & MacPhail, Private Collection, Hermitage wood finish, 4,100 bottles) All right… Some finishing in some big red wine wood (I suppose that wasn’t white Hermitage)… Colour: apricot. Nose: so bizarre… Lapsang souchong and raspberry juice, old wood, muddy stuff, blackberry jam, wet dogs (sorry, dogs), strawberries… This really feels like two whiskies in one. Mouth: so funny indeed. Sam feeling of having two distinct parts, the smoky malt on one side, and a red berry cocktail on the other side. It’s not that it doesn’t work – actually, it does – but it’s just not what I’m looking for in my whiskies. Neither do I need this in my Hermitages, by the way (no kiddin’, S.) Finish: medium, surprisingly clean, and funnily in sync this time. Smoked raspberry jam. Comments: I don’t know, I really don’t know what to say. Oh, this, it was not a very smoky Ledaig. SGP:653 - 78 points. Ledaig 2004/2017 (55.5%, Gordon & MacPhail, Cask Strength, sherry, first fill and refill sherry hogsheads, casks # 16600503-16600506) Colour: hay. Nose: bam! Pure oily peat, golden barley, sunflower oil, smoked butterscotch… It’s amazing to see how Ledaig got cleaner throughout the vintages. I get little sherry here, but I do get vanilla, and then more and more smoky mezcal. Love that. With water: that old tweed jacket after having spent a whole evening near a bonfire on the beach. Mouth (neat): that distillery near that cross on that shore on that island. Wonderful grapefruits, tar, smoked fish… With water: amazing grapefruits, tar, kippers… Finish: same for a long time. Brine-y aftertaste. Comments: I’m trying to remain very elliptic. Great smoky whisky, though. SGP:557 - 90 points. Ledaig 2005/2017 (56.6%, Signatory Vintage for La Maison du Whisky) A simple feather light label, that’s perfect. Colour: gold. Nose: the cask has been active, this has got butterscotch, croissants, vanilla, also peat smoke, lit cigar, creosote, burnt parsley, roasted pecans, a touch of natural rubber… So not our average Ledaig, but this works greatly. With water: flabbergasting. Yeasty/smoky, as if they had distilled some manzanilla. Mouth (neat): amazingly sharp, millimetric, blade-y, lemony, smoky, and herbal. Caraway, chives, aniseed, juniper, all that being smoked to the bones. With water: perfect. What a spirit! And a superb wee sourness in the back, as in a great chenin. Blanc, that would be chenin blanc. Finish: long, very race-y, elegant, with just the right amount of lemons and peat smoke. Comments: ssshhh… SGP:467 - 91 points. 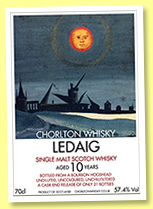 Ledaig 10 yo (57.4%, Chorlton Whisky, bourbon hogshead, 2017) A very small operation this, more boutique-y than the boutique-y boys, but I’ve tried some very good ones already. Plus, the labels are lovely. Colour: white wine. Nose: essentially young Ledaig, that is to say gathering bitter almonds, smoked tea, brine, sea shells, and hessian. And that old tweed jacket. With water: brine, smoke and lemon juice, that winning combo. Mouth (neat): amazing. Pure crystalline, and yet fat and oily, lemony, mezcaly peat. There. With water: so good! Finish: long, tarry, smoky, lemony, brine-y. A song that we all know well. Superb verbena in the aftertaste. Comments: OK I’ll say it, why isn’t modern A****g like this? 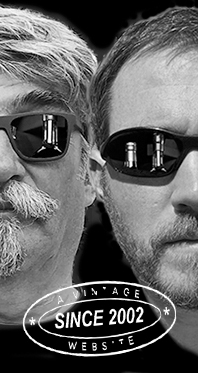 Smashing, brilliant, fantastic… But yeah, ssshhh… SGP:457 - 91 points. Ledaig 10 yo (46.3%, OB, +/-2017) I last tried this expression in 2012. I appreciated it… moderately (WF 80). Colour: white wine. Nose: fine, light, with whiffs of carbon paper and new leatherette, new plastic bags at the supermarket (banned in France, though), lemon zests, smoked tea, and coal/soot. It’s not big, but I think it’s cleaner than its earlier inceptions. Mouth: no, it’s good, really. It’s lacking a part of the lemony side that works so well with many young indies, but on the other hand, there are nice notes of coffee and vanilla, from the wood, most probably. That’s the problem with most distillery owners, they tend to overdo the oak part. But we’re fine here, it’s, well, a very fine dram. And hey, let’s remember that earlier official Ledaigs had been terrible, feinty, butyric, gym-socky, puk… Ok, ok, we’re all done here. Finish: medium, brine-y, a tad sour. Comments: a very, very fine Ledaig, for sure. It’s just that the thousands of indie bottlers around us are having even better ones these days. Only IMHO, of course. SGP:456 - 83 points.